In 1967 the DBS was intended to replace the DB6, but production of the latter did not stop until 1970. Due to customer demand a V8 version was developed. In 1966, Touring of Milan had been commissioned to design the DB6 replacement and two striking prototypes had been produced before the design house went out of business. William Towns was hastily brought in to design the new car, which was unveiled at Blenheim Palace on September 25, 1967, and initially only intended for limited production. In its original guise the DBS retained the six-cylinder, 3,995 cc engine, available in Standard or Vantage form as used in the DB6. The original plan had been to use an all new V8 engine, but this was not ready in time. The clean, modern lines of the new DBS found favour with many owners who required more interior space, and the car was a full four seater. The adoption of a De Dion rear axle was a departure from previous models and the striking grille design was still unmistakably Aston Martin. In order to counter the increased weight of the DBS, the Vantage version boasted revised camshafts to boost performance. In April 1972, a revised DBS was introduced with two headlamps rather than four. Simply called the AM Vantage, 70 examples of this model were produced. The second Aston Martin to star in the James Bond film series, a DBS had a starring role in the 1969 George Lazenby movie ‘On Her Majesty’s Secret Service’. This was a one-off Bond appearance for both actor and car; it would be another 18 years before 007 would drive an Aston Martin again. After an announcement on 27 September, 1969, the DBS was made available with the long awaited V8 engine, with the car being known as the DBSV8 – a four-seat grand touring car, capable of 160 mph. As with the straight six, the design of the new V8 engine was the work of Tadek Marek. With a capacity of 5340cc and 4 overhead camshafts with Bosch mechanical fuel injection, the DBSV8 was the fastest 4 seater production car in the world at the time. This engine was to form the basis of all Aston Martin power plants for the next 20 years. Apart from the change of engine, notable visual differences were the specially designed 15’’ GKN light alloy wheels (as opposed to the distinctive wire wheels employed on the DBS), with ventilated brake discs for the first time on an Aston Martin production car. A Chrysler Toqueflite auto transmission was offered as an alternative to the ZF manual 5 speed unit. 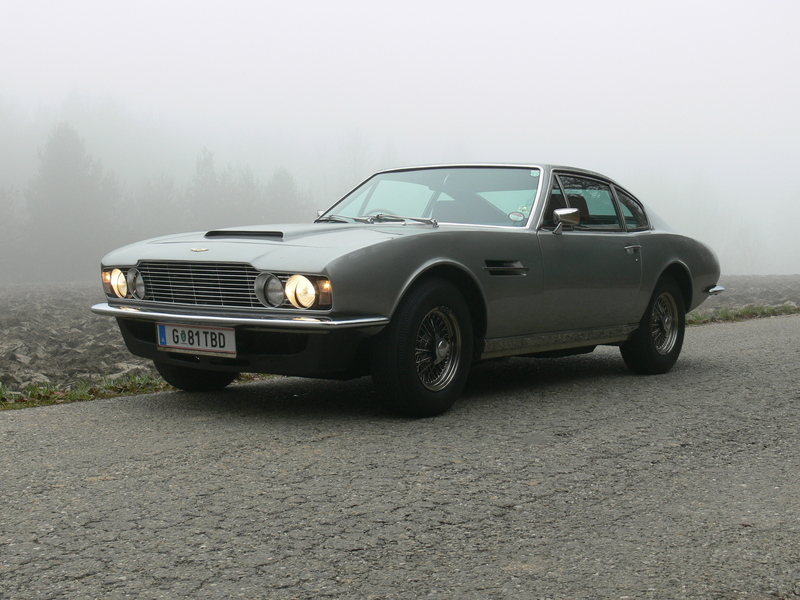 In common with the 6 cylinder DBS, the DBSV8 was produced until May 1972, after which the car adopted the later single headlamp front end. New owner, Company Developments Ltd, renamed the car AM V8.